Welcome to your new favorite sour worms. 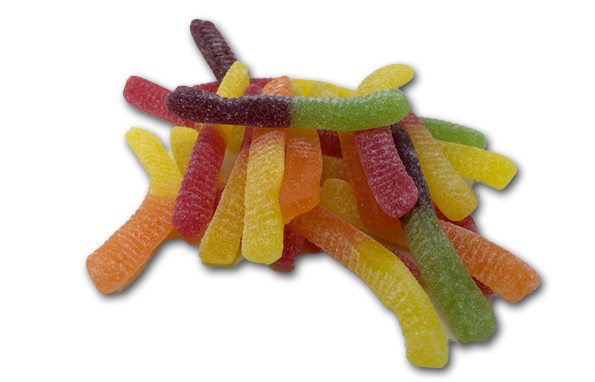 In fact, this reviewer is wagering a claim that these are, in fact, the best sour worms out there. Remember our friends “The Natural Confectionary Company”? 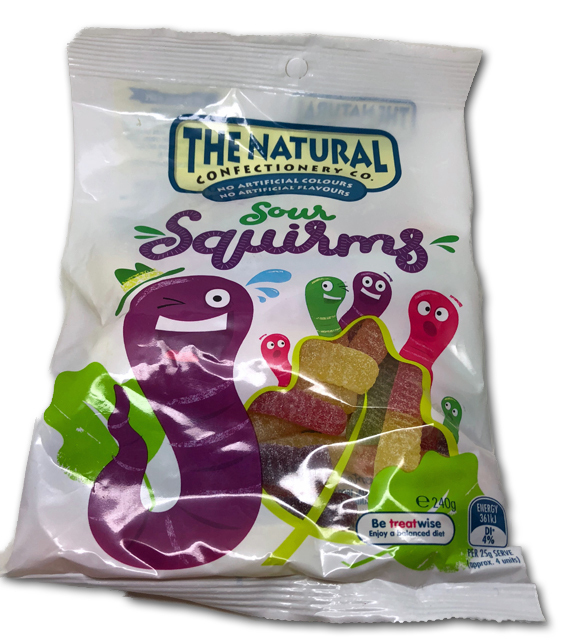 My literal broham discovered them in Australia while on a boondoggle, and since then has been required to keep me in steady supply-of their regular worms which are wonderful. But then one time, he pulled an audible and added some of these squirms. Honestly, I was sure they’d be a compromise-they looked predictably “sour powdered” on the outside, but also aren’t as long as the originals, so I was sure the fix was on. 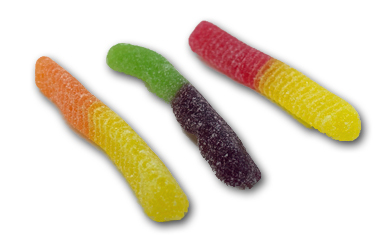 These were gonna be just like every other crap gas station sour worm that’s bamboozled Americans for decades. Yes, they’re different in size. And yes, there’s a “ribbed” texture to them, and of course the sour powder. So they’re different. But really…they’re not. They’re the exact same delightful jelly-ish gummy, full of the same refreshing flavors, but very nicely sour. Same bite to them-meaning you can bite right through them, as they’re not a traditional gummy. But that sour, it just explodes the flavor in the best way. The flavors are Wild blackcurrant, Juicy orange, Delectable smooth banana, Ripe raspberry, and Tangy lime. I guess banana is on two different pieces, and that’s a good thing. It’s really great. And remember-there’s no artificer colors or flavors happening here. There’s a strong, fresh reality to these flavors that just isn’t common these days. Word of warning though-the link below is for six bags. Six bags!? Is this guy crazy? No, I’m just being realistic. It’s by far the best value Amazon has, and you’re gonna blaze through 2 bags immediately. Your kid is taking one when you’re asleep, so that leaves you three. And if you don’t have kids, then someone else is stealing some because that’s the American way. Trust me, you’ll thank me later.